Gelato! Photo Slide Show Page will be updated with Summer 2013 news soon! Please enjoy other Gelato! Art Salon content pages. Deadline to submit work has been EXTENDED due to request to FRIDAY July 6th 2012 at Midnight (Eastern Standard Time). Submission form to participate to next Gelato! Photo Slide Show is linked below. Btw, you don't have to live or be in New York to submit and participate in the show, we welcome friends from overseas to send in images. NOTE TO FILMMAKERS: Gelato! Photo Slide Show also accepts short videos!!! Anyone who wants to exhibit their art to Gelato! Collective Fine Art Gallery, Gelato! 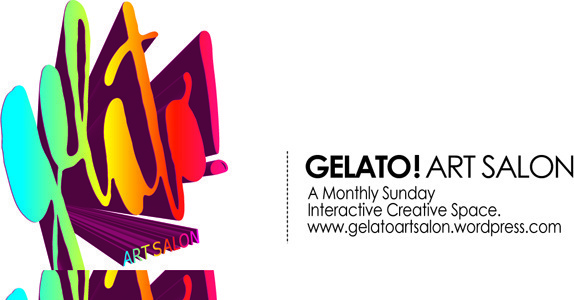 Art Salon events or The Gelato! Website may submit. If my work is accepted to the Art Salon will it be displayed on the website ? All artists who have been picked to exhibit in a Gelato! Show will have their work posted for a limited time in the form which we choose and which is technically possible at the moment. This may be in a form of a group page with two images per artist placed under the date of the event. Or it may be in the Gelato! Art Salon Photo memories or Facebook page with photos of your art hanging at the show. The group page will be up for a minimum of 4 months and either taken down or regulated to the archive. I see artists with their own page on the website, can I have my own page on the website ? Only artists who have been formally accepted into the Gelato! Collective or have paid a yearly membership can have their own page. At the moment we are not funded and it is obviously unfeasible for the collective to support artists who do not work with or support in some way monetarily the efforts of the collective. We’ve tried it. It doesn’t work and we don’t have the resources. Gelato! Membership information, applications and applicable benefits will be posted and available for the general public soon. What can be submitted ? Any style or medium of art may be submitted except that which is hated filled, racist, or otherwise contrary to common respect for others. All art is subject for approval for display in the Gelato! Art Salon. We reserve the right to reject any art which does not meet our needs and/or standards. Each artist may submit and exhibit up to 8 pieces from which 2- 4 works of art at a time. will be chosen for display depending on available space All artwork submitted must be available for sale, excluding installation pieces, which is at the discretion of the artist. Once an artist’s work of art has been purchased then the artist may submit another work of art to exhibit in its place. Gelato! Collective Fine Art Gallery to transact the payment. If this is not possible due to time constraints the artist agrees to pay the Collective its 20% commission, respecting Gelato! Collective Fine Art Gallery role in facilitating the financial transaction. We operate on the trust system. If the artist fails to do this we reserve the right discontinue association with the artist. Upon receipt of the art, the Buyer has 3 days to have their own expert inspect the work and notify us that the work of art is acceptable and the sale is approved. Upon approval of the sale, we will release the funds to the Seller less the commission Fee. All sales are final. It is the artist’s responsibility to price artwork. We do not appraise art. Artists are to price art at a minimum of $100.00 per piece. Take into account our fee and insurance, shipping and handling costs when pricing your art. The buyer has 5 days from the time of sale to cancel the transaction after which all sales are final. The artist is responsible for shipping and handling or otherwise getting the artwork to the buyer. Proper packaging and shipping is essential so the art work does not get damaged during delivery. Once the buyers payment has been received and verified you will be sent via email the address for which you are to mail or hand deliver your art to. Once we have emailed you the address, you need to send or take your art as soon as possible. It is important for you to keep a receipt of the date it is mailed or received. Tell the postmaster that you want the art shipped so that the buyer has to sign for it upon receiving it so you know the date the buyer has received it. The buyer will have 3 days after that date to have an inspection or appraisal of the art before the sale is finalized. Gelato! Collective Fine Arts Gallery welcomes International artists to our shows and to our website. However, please remember that you are responsible for all shipping and handling fees if a buyer in another country purchases your art. Also, all checks from Gelato! Collective Fine Art Gallery made payable to artists will be made in U.S. currency. By submitting your art you are agreeing to our terms and that it is your original art and that you are the author and creator of that art. You cannot sell art at Gelato! that another person (living or deceased) has created even if you are the owner. It must be your own original work of art. By submitting your art you are agreeing to pay for and provide proper shipping and handling of that art to the buyer of it. Gelato! Collective Fine Art Gallery is not responsible for lost, stolen, misdirected or damaged art. By submitting your art you are agreeing to our 20% comission fee that Gelato! Collective Fine Arts Gallery will retain upon the placement of that art to a buyer. Gelato! Collective Fine Art Gallery reserves the right to accept or deny any submission. Gelato! Collective Fine Art Gallery reserves the right to merchandise the images featured in Gelato! Collective Fine Art Gallery. Gelato! Collective Fine Art Gallery and Gelato! Art Salon does not sell personal information. We will only post information that you request we post when fill out our submission forms if your art is selected for a show in Gelato! Fine Art Gallery. Gelato! Collective Fine Art Gallery and Gelato! Art Salon does not sell personal information and does not sell or give out credit information. However, when a customer purchases art from Gelato! Collective Fine Art Gallery and Gelato! Art Salon the customer is asked to provide an address for the art to be shipped to. That address will be given to the artist for the artist to ship the art work. If the customer does not want the artist to receive personal address information then the customer needs to provide an alternate address for the art to be shipped to. Purchasing Art-Process and Terms for Buyers. The buyer of a work of art has 5 days from the date of sale to cancel a transaction. Each buyer is required to supply a shipping address for the work of art. That address will be given to the artist for shipping purposes. Any buyer that does not want his or her personal address given to the artist should provide another address for which to ship the art. Upon approval of the sale, the artist will be given the buyers address for which to ship the art to. The artist will then package and ship the art to the buyer. Upon receipt of the art the buyer has 3 days to have an inspection and/or appraisal of the art and to cancel the transaction. 3 days after receipt of the art by the buyer all sales are final. No information about an artist can be given to a buyer except that which is posted on our site or that which is expressly provided to the buyer by the artist.